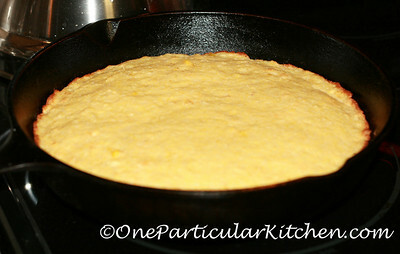 So, in the names of convenience and experimentation, and inspired by a recipe a friend sent me (more on that coming soon) I mixed up one box of Jiffy cornbread mix (SO. GOOD.) with half a can of cream of corn, and half a can of diced pineapple (it’s what I had on hand) that I buzzed around in the food processor a bit till it was more like crushed pineapple. Naturally, I baked it in a cast iron skillet.